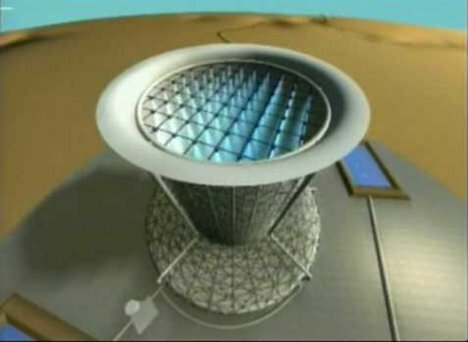 A gigantic tower like the one above could soon be constructed in southwestern Arizona to provide the area with clean, green wind energy – and you won’t believe how simple the mechanism is. 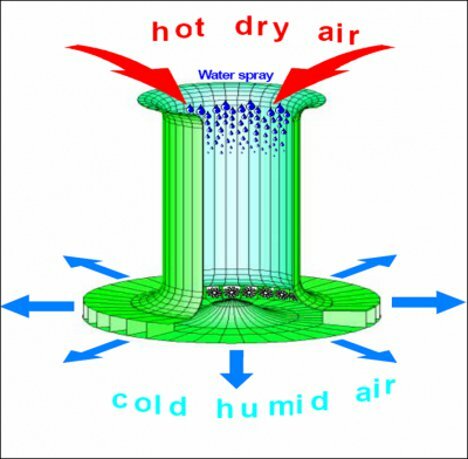 The top mouth of the tower is sprayed with a cool water mist, cooling the air outside of the tower and forcing it down into the bottom of the tower at speeds around 50 MPH. This artificially-created wind turns turbines, generating electricity. It isn’t easy to tell from the renderings, but the proposed tower is meant to be the new biggest structure on earth. If completed as planned, it would be 1200 meters high…or around 4,000 feet. In comparison, the world’s current tallest structure, Dubai’s Burj Khalifa, is 828 meters or 2717 feet tall. It will be effectively dwarfed by the truly mammoth downdraft tower. The company planning to construct the tower is Clean Wind Energy, Inc., and they aren’t just talking in hypotheticals. They have already gotten zoning approval for the project and leased the land near San Luis, Arizona. Who knows – maybe massive energy towers like this could be the wind turbine farm of the future. See more in Energy & Power or under Science. June, 2012.